Which Nation Has the Most Per-Capita Government Spending on Healthcare: France, Italy, the United States, Sweden, Canada, Greece, or the United Kingdom? What government spends the most on health care? Is it Canada or the United Kingdom, which are famous (or, if these stories are any indication, infamous would be a better description) for single-payer healthcare systems? Is it Sweden, the home of the cradle-to-grave welfare state? Or France, the land of the world’s most statist people? How about Italy or Greece, nations that have spent themselves into fiscal crisis? The United States spends more money, on a per-capita basis, than any of those countries. Here’s a chart from a Forbes analysis prepared by Doug Holtz-Eakin and Avik Roy. There are three big reasons why there’s more government-financed healthcare spending in the United States. 1. Richer nations tend to spend more, regardless of how they structure their healthcare systems. 2. As you can see at the 1:18 mark of this video, the United States is halfway down the road to a single-payer system thanks to programs such as Medicare and Medicaid. 3. America’s pervasive government-created third-party payer system leads to high prices and costly inefficiency. So what’s the moral of the story? Simple, notwithstanding the shallow rhetoric that dominates much of the debate, the United States does not have anything close to a free-market healthcare system. That was true before Obamacare and it’s even more true now that Obamacare has been enacted. Indeed, it’s quite likely that many nations with “guaranteed” health care actually have more market-oriented systems than the United States. Avik Roy argues, for instance, that Switzerland’s system is the best in the world. And the chart above certainly shows less direct government spending. 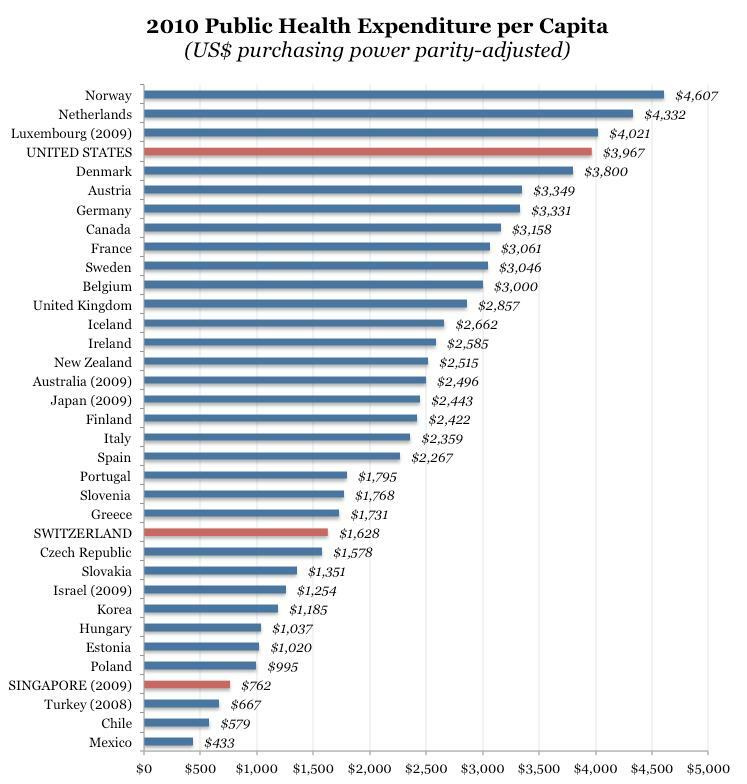 And there’s also the example of Singapore, which also is a very rich nation that has far less government spending on healthcare than the United States. If you read the Avik Roy articles linked above, and also this study by my Cato colleague Mike Tanner, you’ll see that there’s no perfect system. Our challenge is that it’s very difficult to put toothpaste back in a tube. Thanks to government programs and backdoor intervention through the tax code, the United States healthcare system is nowhere close to a free market (with a few minor exceptions such as cosmetic surgery and – regardless of what you think of the procedure – abortion). Yes, I think entitlement reform can make things better, though fixing Medicare and Medicaid should be seen as a necessary but not sufficient condition. As I show in this post, we would simply move a little bit in the right direction on the spectrum between markets and statism. Tax reform could solve another part of the problem by removing the bias for over-insurance, which presumably would lead people to pay out of pocket and use insurance for large, unexpected costs. Fundamental tax reform is also the best way to improve the healthcare system. Under current law, compensation in the form of fringe benefits such as health insurance is tax free. Not only is it deductible to employers and non-taxable to employees, it also isn’t hit by the payroll tax. This creates a huge incentive for gold-plated health insurance policies that cover routine costs and have very low deductibles. …Shifting to a flat tax means that all forms of employee compensation are taxed at the same low rate, a reform that presumably over time will encourage both employers and employees to migrate away from the inefficient over-use of insurance that characterizes the current system. For all intents and purposes, the health insurance market presumably would begin to resemble the vastly more efficient and consumer-friendly auto insurance and homeowner’s insurance markets. In other words, as this poster suggests, government is the problem and less government is the solution. You have said yourself Rockefeller did it. A competitive market did not ergo a misallocation of resources and no consumer sovereignty. You either believe in competitive markets or you do not. The major consumers are producers whose profit margin has gone up enormously because of his market power. A producer who can decrease prices can increase prices just as easily. You cannot have market power in a competitive market. In a competitive market , if it is possible,the poor, needy and elderly miss out on health insurance. The young and healthy possibly will not want it. Rockefeller drops the price of the product to the consumer by 80%, but you’re concerned about Standard Oil’s high profit margin?! 200 producers, cost to consumer $1.00 per gallon, avg profit margin 10%. 10 producers, cost to consumer $0.20 per gallon, avg profit margin 20%. You apparently prefer Scenario A. I call that illogical. Consumers are better off with B. So are the remaining producers. What do you know, new wealth can be created and all can benefit! What were important input costs to the robber barons.so their profit margins were so large. err yes. the robber barons got big only because they won competitions and gave consumers a better deal. if consumers didnt want them to win, they would not have. consumers were quite happy to see the price of kerosene drop by 80% (for one example). err no. Huge markups in industries where there little competition. That is monopoly profits and distorts the allocation of resources. lower priced goods does not mean consumer sovereignty by the way. consumer sovereignty, because they got lower-priced and better goods. mate with the robber barons, did consumer sovereignty rein or do Producer sovereignty reign. No competitive or ‘free’ markets with those blokes. I give up on free markets vs competitive markets. Makes no sense to me. I actually do know my robber baron history. I know that Rockefeller, Carnegie, Vanderbilt, etc ruthlessly pursued market share. I know that they lowered the price of kerosene, steel, transportation, etc., benefiting the common man tremendously. I know that their competitors hated them for their efficiency and smeared them in the press and tried to use govt power to stop them. And that is how they got such a bad name, perpetuated into legend in the years since by anti-market journalists and professors. You are too black-and-white on competition in health care. There certainly can be more competition in the markets for insurance and medical care. It could be segregated, with competitive markets for non-catastrophic items, and a govt-regulated insurance for catastrophic care. I don’t know the Australian system, but I guarantee more competition could be done in the US. Can you have competitive markets in health care? Of course not. no-one would insure poor and needy people nor older people. Which ever way you look at it governments have to ‘force’ young people who are unlikely to have health problems to subside those I have talked about. We do it down under. I repeat: (mostly) free markets ARE competitive. (Mostly) free market means there are few obstacles to competition. (Mostly) free market means that buyers and sellers are (mostly) free to transact as they wish. (Mostly) free market means that it’s easy to start a new business and to import, meaning more competition is never far away. You seem to be unaware, but much regulation serves to stifle competition. In part because larger companies coopt the power of government to give themselves advantages. Because yes, crony capitalists don’t like free and competitive markets and instead prefer to use the power of government to avoid competition. No you are incorrect. In the land of the former robber barons you surely should realise free markets do not work. consumer sovereignty is not working at all. you need government regulation for markets to be competitive and the consumer king. Free markets are uncompetitive markets. Crony Capitalists love free markets but hate competitive markets. Here is another reason why markets do not work in the health care industry. you need young and healthy people to subsidise older sicker people . Poor people are associated with needing more health care as well. Thus you have to have universal heath care mixed up with some private health care as we have down under. it aint perfect but it is a hellva lot better than you have there. Of course, you’re not a propagandist, right? Free markets ARE competitive markets. I agree that true competition and free markets are more difficult for health care. However, it’s possible to have more than we currently have. Since the track record of competition and free markets is pretty good in all the other industries, we could try doing more of it in health care. It is a measure of wealth not of numbers. to be honest people who talk of free markets are usually propagandists. What economists look for are competitive markets. There are lots of reasons why you simply will not get that in health care. Possibly the major reason is that the poor and the needy will miss out. Why do you think % of GDP is better or more accurate? Which ‘free market’ system are you talking about? The US does not have a free-market medical industry. Dan says Switzerland is supposed to be more free-market. I know Singapore is more free-market. They spend less. Anyway, the idea of measuring healthcare efficiency by the amount of spending is imprecise. Spending could be low (a) because of competition and efficiency, or (b) because only obsolete and cheap equipment and drugs are used. Similarly, spending could be high (a) because there is little competition and efficiency, or (b) because only the finest equipment and drugs are used. i.e., there are both good and bad reasons for healthcare spending to be high. why do you use per capita spending? Surely % of GDP is more accurate. Great article. Would be even more interesting to see 1. Overall spending per capita per country, 2. Adjusted these numbers for the BIG MAC INDEX since cost of living in Mexico is a FRACTION of cost of living in the USA! Dan- In the early 00’s, I worked for a company where we did fraud detection. We invented the algorithms that are still used today by Visa, Medicare, Medicade, etc. At one time, I had the statistical data to show that over 30% of Medicade was fraud. The question is how much of that fraud can you go after? Some is simply not worth it, as the cost to litigate exceeds the expected recovery. The other problem is that now that the GLB act and HIPPA laws rule the nation, it is very hard to find the true data to investigate fraud. In fact the FBI relies solely on whistleblowers because they cannot look at anybody’s private information (technically speaking). In a three-payer system, there will always be fraud as the recipient does not care so long as his bill is paid, and the payer scarcely has the time or ability to chase down every case of fraud. The paid party therefore has good incentive to pad the bill, or entirely fake it in some cases. As a side note, we found a significant amount of fraud in vehicular warranty systems. Car dealers may not be the most honest people in the world, but the percentages showed them to be a bit more honest than those charging medical fees. I believe that this is the biggest draw for getting the government out of the system. When people start spending their own money, they pay attention to the bills, and the fraud goes away. Remove the fraud from US numbers, and we fall somewhere between Belgium and Great Britain. The important question is how much you get for the money you (or your government) spend. And in terms of outcomes the U.S. is pretty disappointing. Whether you look at child mortality or life expectancy, Switzerland is doing much better than America. In addition, all Swiss receive about the same quality of medical care while the dispersion in the US is much larger. While the Swiss system is certainly not perfect, I still believe the US could learn some lessons. The individual mandate is not a big loss for individual freedom. But hundreds of details in the regulation can be. Interesting. Healthcare has to be the largest budget item in which the purchaser has little say in what he purchases and little to no knowledge of what it costs. And we’re going in very much the wrong and harmful direction.